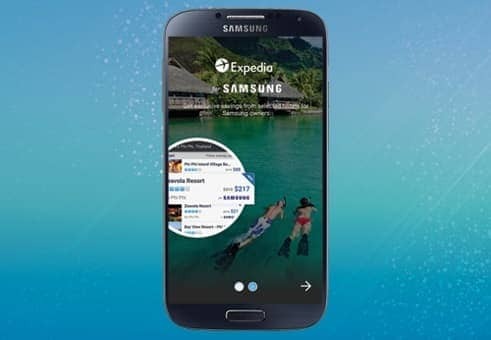 Today we are pleased to announce a new Expedia application (app) specially designed for Samsung users to improve discovery, planning, and savings while booking travel: the “Expedia for Samsung” app! We’ve been working closely with Samsung on this native app, and we think you will like what you see. Samsung Collection. Enjoy a curated travel-discovery experience, exclusive to Samsung consumers. The app’s distinctive launch screen allows you to discover new destinations, indulging your wanderlust. Samsung Member Pricing. The “Expedia for Samsung” app features mobile-exclusive deals that help line your pockets with extra savings! As a Galaxy customer, you are guaranteed to receive the best hotel pricing available from Expedia. User Support. We know the unexpected can happen while you’re traveling. That’s why the “Expedia for Samsung” app will have a dedicated customer support line to answer any questions you may have and provide peace of mind during your trip, no matter the day or time. To sweeten this launch, we are throwing in some extra perks! Once you download the “Expedia for Samsung” app and book a hotel reservation through the app on your Galaxy smartphone, you’ll enjoy $50 off your first hotel reservation over $250. * Claim your coupon code in the Samsung+ app! Download it here on your Samsung Galaxy phone, then visit the “Promotions” section, and your Expedia coupon code will be available in the “Offers” tab. *While supplies last. See terms and conditions at https://www.expedia.com/g/rf/samsung-app-voucher-terms?langid=1033&.